If you spend even a little time thinking about cancer you’ll have realised that it’s very odd – and one oddity in particular may have struck you. A general rule is that it can arise anywhere in the body: breast, bowel and lung are commonly affected, but the more than 200 different types of cancer pop up in lots of other organs (e.g. brain, pancreas), albeit less often. But what about those places of which you hear almost nothing? For example, it’s very unusual to hear of heart or muscle cancers. Which raises the obvious question of why? Is there something going on in these tissues that counters cancer development – acts in some way to slow down tumour formation? And if there is, shouldn’t we find out about it? Zuzana Keckesova, Robert Weinberg and their colleagues from the Whitehead Institute for Biomedical Research, Massachusetts Institute of Technology and other centres have been scratching their heads over this for a while and they’ve recently published an answer – or, at least, one of the answers. To see how their result fits into the jigsaw puzzle we need a quick recap on the chemical processes that go on in cells to keep them alive, aka, metabolism. Occurring in almost all organisms, glycolysis is a central metabolic pathway in which a series of chemical reactions breaks down sugars into smaller compounds, the energy released being captured as ATP (adenosine triphosphate). Needless to say, it’s complicated – there’s 10 steps and it took the best part of 100 years to work them out completely. The story began with the French obsession with wine (which by now they’ve shared with the rest of the world, bless ’em), specifically why sometimes wine tastes horrible. So they put Louis Pasteur on the case and in 1857 he showed that it was all to do with oxygen: if air (oxygen) is present during the fermentation process the yeast cells will grow but fermentation (i.e. alcohol production) will decrease. This showed that living microorganisms were needed for fermentation and led Eduard Buchner to extract the enzymes from yeast and show that they were sufficient to convert glucose to ethanol (alcohol). In other words, you could do it all in a test tube. The cartoon shows sugar crossing a cell membrane (a bilayer of phospholipids). 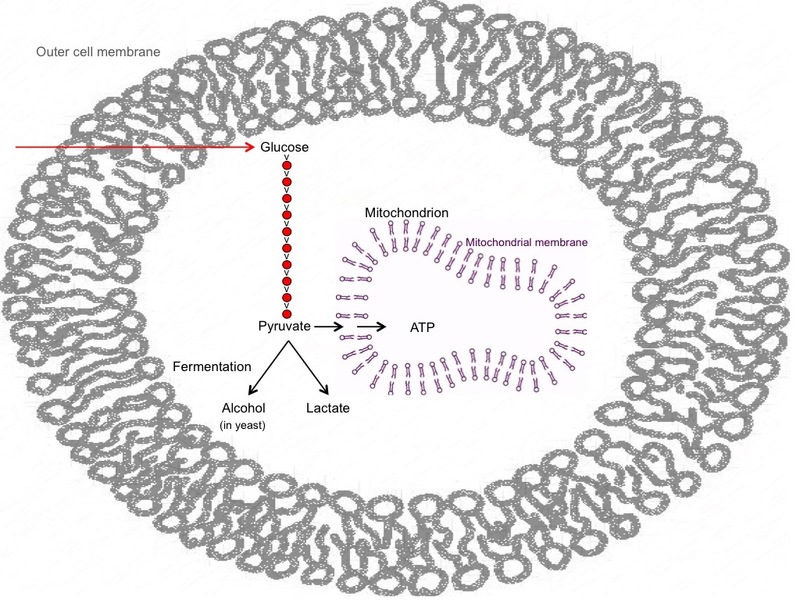 The 10 steps of the glycolytic pathway (red dots) convert glucose to pyruvate that can become lactic acid or cross the membrane (another lipid bilayer) of mitochondria. In these ‘cells within cells’ oxygen is consumed to make ATP from pyruvate. Glycolysis yields 2 ATPs from each glucose. In mitochondria ‘aerobic respiration’ produces 38 ATPs per glucose – which is why they have been called the “powerhouse of the cell”. In yeast, fermentation produces alcohol from pyruvate. This was a stunning achievement because it showed for the first time that living systems weren’t inaccessible black boxes. You could take them to bits, find out what the bits were and reassemble them into something that worked – and that’s really a definition of the science of biochemistry. The upshot was that by the 1930s through the efforts of many gifted scientists, notably Otto Meyerhof and Gustav Embden, we had a step-by-step outline of the pathway now known as glycolysis. But by this point a chap called Otto Warburg had noticed that something odd happened to metabolism in cancer. He showed that tumour cells get most of their energy from glucose using the glycolytic pathway, despite the fact that it is much less efficient than aerobic respiration (2 to 38 ATPs per glucose). And they do this even when lots of oxygen is available. Which seems like molecular madness. Warburg was part of an amazing scientific galaxy in the period from 1901 to 1940 when one out of every three Nobel Prize winners in medicine and the natural sciences was Austrian or German. Born in Freiburg, he completed a PhD in chemistry at Berlin and then qualified in medicine at the University of Heidelberg. Fighting with the Prussian Horse Guards in the First World War, he won an Iron Cross and followed that up with the 1931 Nobel Prize in Physiology or Medicine for showing that aerobic respiration, that is, oxygen consumption, involves proteins that contain iron. However, he made so many contributions to biochemistry that he was actually nominated three times for the prize. His discovery about tumour cells led Warburg to suggest, reasonably but wrongly, that faulty mitochondria cause cancers – whereas we now know that it’s the other way around: metabolic perturbation is just one of the consequences of tumour development. But if upsetting mitochondria gives tumours a helping hand, how about looking for factors that help to keep them normal – i.e. using oxidative phosphorylation. And the obvious place to look is in cells that don’t multiply – i.e. appear cancer-resistant. Which is the idea that led Keckesova & Co to a ‘eureka’ moment. Searching in muscle cells from humans and mice they discovered a protein, LACTB, lurking in their mitochondria. When they artificially made LACTB in a variety of tumour cells both in vitro and in mice it inhibited their growth. In other words, LACTB appears to be a new ‘tumour suppressor’. It turns out that LACTB works in a quite subtle way. It’s only found in mitochondria, not in the main body of the cell, and it plays a part in making the membrane that forms the boundary of the “powerhouse of the cell”. Membranes are made of two layers of phospholipids arranged with their fatty tails facing inwards. They work as regulatable barriers via proteins associated with the membrane that control the passage of small molecules – so, for example, pyruvate that we mentioned earlier uses specific proteins to cross the mitochondrial membrane. But aside from their attached proteins, the lipids themselves are a complex lot: they have a variety of fatty acid tails and different chemical groups decorate the phosphate heads. This gemisch arises in part because the lipids themselves control the proteins that they surround. In other words, if the lipid make-up of a membrane changes so too will the efficiency of embedded transport proteins. LACTB controls the level of one type phospholipid (phosphatidylethanolamine, PE): when LACTB is knocked out more PE is made. Thus this tumour suppressor affects mitochondrial lipid metabolism and hence the make-up of the membrane, and its normal role helps in blocking tumour development. Layers of lipids with their tails pointing inwards make up cell membranes (left): proteins (red & blue blobs) control what can cross the membrane. Phospholipids themselves are a complex mixture with a variety of head groups and fatty acid tails (right). And the method behind the madness? So in this newly-discovered tumour suppressor we have a way in which mitochondria can be subverted to promote tumours by changing the properties of their membrane. But what’s the point? Why might it be more profitable for cancer cells to get most of their energy via a high rate of glycolysis rather than by the much more efficient route of oxidising pyruvate in mitochondria – a switch often called The Warburg effect. There seem to be two main reasons. One is that pathways branch off from glycolysis that provide components to make new DNA – greater flow though glycolysis makes those pathways more active too – a good thing if cells are going to reproduce. The second is that making abnormal amounts of lactic acid actually helps tumour cells to survive and proliferate, it stimulates the growth of new blood vessels to feed the tumour and it can make the immune response – the defence normally mounted by the host against tumours – less effective. By affecting mitochondrial function, mutations that knock out LACTB can give the Warburg effect a helping hand and – if the great man’s still following the literature – he may have noted with some glee that this finding, at least, is consistent with his idea that it all starts in mitochondria!